On October 1st, Alfresco Disco returned to the South West with another mysteriously wonderful event. 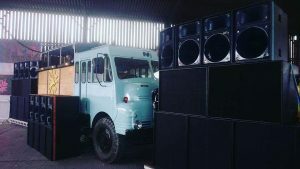 In true Alfresco Style, the lineup and location remained completely under wraps until a convoy of buses collected the eager rave-attendees and dropped them at a late 80’s/early 90’s Sunrise Party inspired event, hidden within Easter Compton. Alfresco Disco, having performed on the back of the Truck at Boardmasters and The Masked Ball invited us along to provide the main stage, dwarfed by speakers the Truck looked awesome.